Engage your organisation from the ground up, with Invotra Polls you can include everyone’s views. Solve tricky challenges with immediate feedback, get answers and relative percentages of votes. 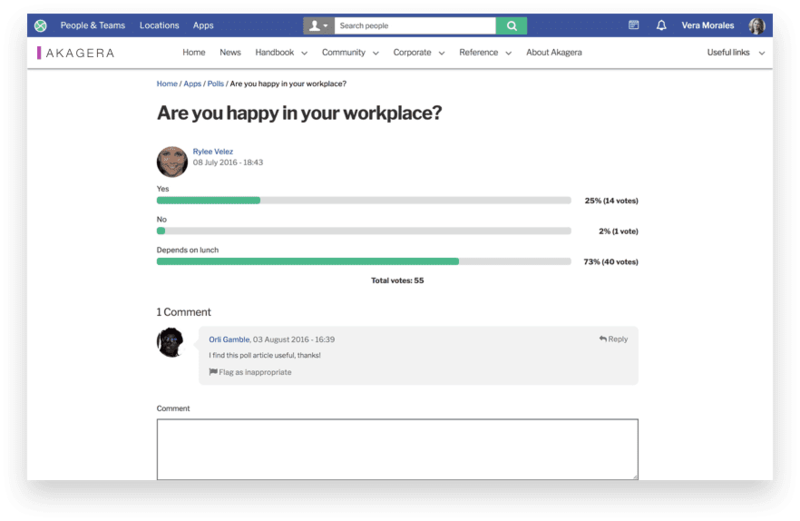 Present organisational challenges directly on your intranet homepage with our poll application for maximum user involvement. Capture opinions of all users about a particular issue using Invotra Polls on your intranet. Collect responses to a question from a set of answers a user has provided all in a visually attractive way. Every time a user responds, the poll will automatically update to show the poll results. Results – Immediately updated results visible with number of participants and percentage results shown. Timing – Availability of poll for responses can be set for a limited time by setting the duration of the poll. Interaction – Comments can be added to the poll and polls can be rated and liked.